45,000 Verizon workers went on strike today in areas from Massachusetts to Washington, D.C. 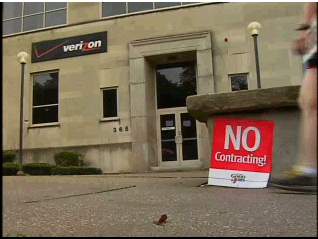 The strike occurred when Verizon Communications workers could not reach an agreement with Verizon, and as of Saturday night at midnight, 45,000 contracts expired. Union representatives were unable to reach a compromise with Verizon on issues including heath care costs and pensions. The strike affects the Verizon wire line divisions which consist of landline phones, cable, and internet services. This division in Verizon has been declining steadily as more people are using their mobile phones in place of home phone lines. This strike has no impact, and no disruption of services in Verizon Wireless. However, this does give more unwanted press toward Verizon. Just recently, Verizon was getting hammered by the press, and investors, for its lack luster iPhone sales. Verizon’s response was that it’s actually Apple’s fault because Apple was taking so long to ship the next generation iPhone.